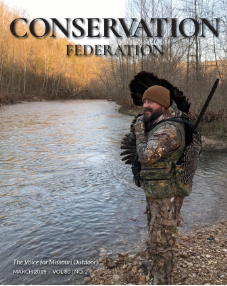 For nearly 80 years, CFM has been known as “The Voice for Missouri’s Outdoors.” Actively involved in state and national issues relating to conservation and natural resources, the Federation has long been a prominent and effective leader, respected for our opinion and fairness. Our history of standing tall for Missouri conservation speaks for itself. Today, however, many voices are vying for the listener’s ear, and it has become increasingly difficult to distinguish which issues are important and worthy of our time. We believe it is our duty to sort through the clutter, and to advance a balanced opinion representative of the views and values held by all Missourians who believe in the idea of wise use and scientific management of our state’s abundant natural resources. We also understand that no single organization can tackle the challenges alone. We are committed to the notion that the work of well-informed citizens is the quickest path to success when armed with facts and an understanding of the process. For these reasons, we are committed to serving as a convener, facilitator, and coordinator for the purpose of building relationships and achieving common goals between and among interest groups; to working with all organizations and agencies to develop and advance programs and policies important to our members, affiliates, and conservationists across the state; and to formulating well developed, defensible positions on topics of interest to our members and affiliates. A critical activity performed by CFM is the monitoring of conservation and natural resource issues and the formulation of an organizational stance or position based on the best available information and/or science. Member and board supported resolutions are frequently developed as a means of expressing CFM support, opposition, recognition, or advice on a particular topic. CFM resolutions are one of the most powerful expressions of our opinion as a conservation organization. GOAL 1.– To regularly monitor issues important to CFM and to prepare well researched, vetted, and timely resolutions consistent with our organizational mission and goals. The Resolutions Process follows the monthly timeline below. Of course, members/affiliate members may bring important issues to the attention of the Executive Director or any Resource Advisory Committee (RAC) Chair at any time during the year. Issues outside of convention will be handled by a letter or resolution from the Executive Director, President, or Executive Committee, with input from the appropriate RACs, and the Resolutions Committee. October – December is the time for you to act if you want thorough consideration and/or a resolution on an issue at the next convention. By following the timeline below, members ensure important issues can be fully researched and developed in advance of the convention. Convention resolutions are prepared in advance, and will be “pre-filed” in the months leading up to the annual convention. All of these pre-filed resolutions will be in DRAFT form, until finally discussed and voted on at the convention. By the time of the convention, there will already have been considerable work, background research, and time devoted to each pre-filed resolution – especially by the Resource Advisory Committee members of each committee involved in the development. October – December– Resource Advisory Committees (RACs) begin advance work on the most important issues/topics (calling only on their committee members, unless those of you who are not committee members share issues/topics directly with the RAC Chair). December 31– Deadline for issues/topics submitted to RAC Chairs to be considered for any pre-filed resolutions for the annual convention. January– Individual RACs hold workshops with their official committee members to develop DRAFT resolutions and the convention agenda for their committees. February 1– Deadline for RAC pre-filed DRAFT resolutions to be submitted to the Resolutions Committee. February 15– Resolutions Committee informs RAC Chairs whether pre-filed DRAFT resolutions will advance/not advance, or need some changes. March 1– All pre-filed DRAFT resolutions are announced on the CFM website & compiled for convention attendees. Convention First Day A.M.– RAC meetings re:presentations, pre-filed resolutions discussion and voting (this is also a time when any emergency resolutions may be offered by those in attendance, but if it is not truly an emergency issue/topic, it will not be considered – this is at the discretion of the committee chairperson, or the Resolutions Committee). Convention First Day P.M.– Resolutions Committee considers the final docket of all pre-filed resolutions that were voted to move forward out of each RAC, and any emergency resolutions that the RAC advanced. Convention Day 2 A.M. – Resolutions Committee presents final resolutions docket for General Assembly vote. You can find the names of RAC Chairs and Executive Director contact information on the CFM website. Thank you for being a conservation advocate – get on board and get your issues considered! Please see the following links for more information. Resource Advisory Committee List– This list shows the names of the Committee and examples of topics for each. Committee Membership Request Form– If you would like to serve on any Resource Advisory Committee (RAC), please submit this form to Executive Director, Brandon Butler or Director of Operations, Micaela Haymaker. Member/Affiliate Request of Conservation Issue Review – Any member of the Federation may request consideration or review of a relevant conservation issue or topic. For pre-filed resolutions to be presented at annual convention, this form needs to be submitted to Executive Director, Brandon Butler or Director of Operations, Micaela Haymaker by December 31. Steps for Resolution Process – Steps for the process of a Resolution to be presented at Convention.